The 427th Reconnaissance Squadron is an inactive United States Air Force unit. It was most recently assigned to the 9th Operations Group of Air Combat Command at Beale Air Force Base, California, where it had been activated in 2012 to operate the MC-12 Liberty reconnaissance aircraft and train Liberty aircrews. The squadron was inactivated in November 2015 as the United States Air Force transferred the MC-12 mission to the United States Army. The squadron's roots go back to World War I, when it was organized as the 38th Aero Squadron, a training unit that served in Texas and Illinois. When the United States Army Air Service reorganized its training units in July 1918, the squadron was renamed Squadron A, Chanute Field. Following the Armistice of 11 November 1918, the squadron was demobilized in December. The World War I squadron was consolidated with the 38th Pursuit Squadron when that unit was activated in 1933, although it was not equipped before it was inactivated in 1935. The squadron was activated again in 1936 as the 38th Reconnaissance Squadron, forming the long range reconnaissance arm of the 1st Wing. The squadron was attached to the 19th Bombardment Group and began its deployment to join the group in the Philippines in December 1941. However, the 38th's Boeing B-17 Flying Fortresses arrived at Hickam Field while it was under attack by the Imperial Japanese Naval Air Service. Squadron planes not destroyed during the attack were diverted to other units and the squadron reformed as part of the 303d Bombardment Group. As the 427th Bombardment Squadron, it was one of the first B-17 units to deploy to the European Theater of Operations, earning a Distinguished Unit Citation as it participated in the strategic bombardment of Germany from 1942 to 1945, when it was inactivated. The squadron was activated at Davis-Monthan Air Force Base in December 1958, when Strategic Air Command (SAC) reorganized its Boeing B-47 Stratojet wings to meet its commitment to maintain one third of its bombers on alert. In 1962, SAC began to keep half its bombers on alert and the squadron was inactivated. The squadron was first organized as a provisional unit at Kelly Field, Texas in June 1917. In early August the unit received formal recognition as the 38th Aero Squadron as the United States expanded the United States Army Air Service after entering World War I. A few weeks later, the squadron moved to Chanute Field, Illinois, where it served as a training unit, equipped with Curtiss JN-4 and DH-4 single engined biplanes. In July 1918, the Air Service renamed its squadrons at training fields if they were not programmed for overseas deployment as lettered squadrons and the 38th became Squadron A, Chanute Field. The squadron was demobilized in December 1918 as Chanute prepared to transition from a pilot training field into a temporary storage depot following the Armistice of 11 November 1918. The Air Service constituted the 38th Pursuit Squadron in March 1923, but it remained on the inactive list. If activated or mobilized the squadron was to form part of the 16th Pursuit Group at Kelly Field, but this mobilization plan was not implemented. The squadron was finally activated in August 1933 at Selfridge Field, Michigan, after having been consolidated with the original Aero Squadron. Although the squadron was nominally assigned to the 18th Pursuit Group at Wheeler Field, Hawaii, it was attached to the 1st Pursuit Group at Selfridge. The squadron was minimally manned at Selfridge and apparently was never equipped while stationed there. In March 1935, the 38th was inactivated and simultaneously redesignated the 38th Observation Squadron. In September 1936, the squadron was redesignated the 38th Reconnaissance Squadron and activated at March Field, California in 1936 as the long range reconnaissance arm of the 1st Wing, flying Martin B-10s. The group was attached to the 19th Bombardment Group, whose squadrons also flew the B-10. Like most reconnaissance squadrons of the period, the squadron flew an assortment of aircraft equipped for reconnaissance as well as its primary aircraft. In addition to the Martin Bombers, the squadron also flew Douglas OA-4 Dolphins and Northrop A-17s. The following year, the squadron added Sikorsky Y10A-8 amphibians to its list of aircraft. Along with the 19th Group, the squadron's primary aircraft was upgraded to the Douglas B-18A Bolo, then to early models of the Boeing B-17 Flying Fortress. In June 1941, the squadron departed March along with the 19th Group for the newly constructed Army Air Base Albuquerque, New Mexico. As tensions with the Japanese Empire rose, the 19th Group was ordered to reinforce the Philippine Department Air Force. Group headquarters and the 30th and 93d Bombardment Squadrons left Albuquerque for Clark Air Base in September and October 1941. The 38th Squadron was ordered to reinforce the 19th Group in the Philippines. Its air echelon staged through Hamilton Field, California for deployment, but did not begin its movement to Clark Field until 6 December 1941. The squadron's B-17s arrived at Hickam Field, Hawaii on the morning of 7 December 1941 as the Imperial Japanese Naval Air Service was attacking Hickam. Most of the squadron's aircraft were destroyed or damaged as they attempted to land during the attack. From December 1941 until February 1942 the remains of the air echelon flew patrol and search missions from Hawaii under the direction of the Hawaiian Air Force when its personnel and equipment were absorbed by other units. Meanwhile, the squadron's ground echelon also departed for the Philippines on 6 December, but traveled by ship, departing from San Francisco. However, due to the Japanese attacks in Hawaii and the Philippines, its transport was ordered to return on 9 December 1941. By January 1942 it became obvious that there was no immediate threat to the Pacific coast[note 3] and the movement of aircraft to the Pacific could be resumed. In February 1942, the Sierra Bombardment Group was discontinued and the squadron returned to its assignment to the 19th Bombardment Group. In March the squadron moved to Gowen Field, Idaho, where it was attached to the 303d Bombardment Group, which had been organized the previous month, for training and expansion with a new air echelon. Shortly after its arrival at Gowen, the 303d Group's 31st Reconnaissance Squadron was inactivated and its planes and personnel were used to bring the 38th up to strength. At the end of the month, the 38th was transferred from the 19th to the 303d Bombardment Group. In April the Army Air Forces recognized there was little difference between the reconnaissance squadrons assigned to heavy bombardment groups and their companion bombardment squadrons, and dropped their "reconnaissance" designation. In this renaming, the 38th became the 427th Bombardment Squadron. The ground echelon departed Biggs Field, Texas in August 1942, arriving at Fort Dix on 24 August. It sailed aboard the RMS Queen Mary and arrived in Great Britain on 10 September. The air echelon flew through Kellogg Field, Michigan and Dow Field, Maine before ferrying its planes across the Atlantic. Due to the haste to move heavy bombers to Europe, the squadron was insufficiently trained for combat and it continued to train in England until it entered combat on 17 November 1942 in a strike against Saint-Nazaire, but returned without striking, having been unable to locate its target. It attacked Saint-Nazaire the following day, although its intended target was La Pallice. Its initial raids were on airfields, railroads and submarine pens in France. As a unit of one of only four Flying Fortress groups in VIII Bomber Command during late 1942 and early 1943, the squadron participated in the development of the tactics that would be used throughout the air campaign against Germany. In 1943, the squadron began flying missions to Germany, participating in the first attack by American heavy bombers on a target in Germany, a raid on the submarine yards at Wilhelmshaven on 27 January 1943. From that time, it concentrated primarily on strategic bombardment of German industry, marshalling yards, and other strategic targets, including the ball bearing plants at Schweinfurt, shipyards at Bremen and an aircraft engine factory at Hamburg. The 427th received a Distinguished Unit Citation when adverse weather on 11 January 1944 prevented its fighter cover from joining the group, exposing it to continuous attacks by Luftwaffe fighters. Despite this opposition, the unit successfully struck an aircraft assembly plant at Oschersleben. Although a strategic bombing unit, the squadron was diverted on occasion to close air support and interdiction for ground forces. It attacked gun emplacements and bridges in the Pas-de-Calais during Operation Overlord, the invasion of Normandy, in June 1944; bombed enemy troops during Operation Cobra, the breakout at Saint Lo, and during the Battle of the Bulge. It bombed military installations near Wesel during Operation Lumberjack, the Allied assault across the Rhine. Its last combat mission was an attack on 25 April 1945 against an armament factory at Pilsen (now Plzeň). Following VE Day in May 1945 the 303d Group was reassigned to the North African Division, Air Transport Command and moved to Casablanca Airfield, French Morocco to use its B-17 bombers as transports, ferrying personnel from France to Morocco. However, the two B-17 groups moved to Casablanca proved surplus to Air Transport Command's needs and the squadron was inactivated in late July 1945 and its planes ferried back to the United States. From 1958, the Boeing B-47 Stratojet wings of Strategic Air Command (SAC) began to assume an alert posture at their home bases, reducing the amount of time spent on alert at overseas bases. The SAC alert cycle divided itself into four parts: planning, flying, alert and rest to meet General Thomas S. Power’s initial goal of maintaining one third of SAC’s planes on fifteen minute ground alert, fully fueled and ready for combat to reduce vulnerability to a Soviet missile strike. To implement this new system B-47 wings reorganized from three to four squadrons. The 427th was activated at Davis-Monthan Air Force Base as the fourth squadron of the 303d Bombardment Wing. The alert commintment was increased to half the wing's aircraft in 1962 and the four squadron pattern no longer met the alert cycle commitment, so the squadron was inactivated on 1 January 1962. The 427th Reconnaissance Squadron was activated at Beale Air Force Base, California in May 2012 to manage combat readiness training for the MC-12W Liberty. It organized, trained, equipped and deployed MC-12W aircraft and aircrew in support of combat commander directed operational requirements. Its personnel included pilots, sensor operators and supporting airment. During its tenure at Beale, the 427th flew 4,770 combat missions, which resulted claims that over 500 enemy combatants were eliminated. The MC-12W mission was transferred from the United States Air Force to the United States Army in October 2015 and the squadron was inactivated in a ceremony held on 20 November 2015. 303d Bombardment Wing, 1 December 1958 – 1 January 1962. ^ This plane, serial 40-2070 was caught on approach to Hickam on 7 December 1941 by strafing Japanese fighters, who left it burned out on the ramp. The bomber's flare storage box had been struck by rounds fired by the Japanese fighters as the Fortress approached Hickam. 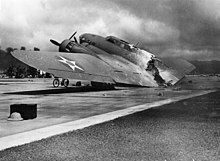 The pilot managed to land the burning B-17, which broke in half upon hitting the runway and came to rest just short of the Hale Makai barracks. All of the crewmen but one survived the landing. ^ Aircraft is Boeing B-17F Flying Fortress serial 42-5392, named "Stric Nine/City of Albuquerque". the aircraft shows the group "Triangle C" on the tail and symbols for 20 combat missions completed and 11 enemy aircraft shot down on its fuselage. This aircraft was lost 19 August 1943 attacking the Gilze-Rijen and Flushing Airfields in the Netherlands. Both aircrew and squadron support personnel (including the mascot dog) are included in this picture taken at Molesworth. A version of the official squadron emblem is also displayed. ^ Most, but not all, DH-4s built in the United States were built by the Dayton-Wright company. ^ a b "Fact Sheet 427th Reconnaissance Squadron". 9th Reconnaissance Wing Public Affairs. Retrieved 30 November 2015. ^ a b c d e f g h i j k l m n o p q r s t u v w x y z aa ab Robertson, Patsy (27 July 2012). "Factsheet 427 Reconnaissance Squadron (ACC)". Air Force Historical Research Agency. Retrieved 30 November 2015. ^ a b c d Robertson, Patsy (2 April 2014). "Factsheet 19 Operations Group (AMC)". Air Force Historical Research Agency. Archived from the original on 4 March 2016. Retrieved 30 November 2015. ^ a b c d e Guthrie, Capt Christine (20 November 2015). "Historic squadron inactivates". 9th Wing Public Affairs. Retrieved 30 November 2015. Warnock, A. Timothy (1994). The Battle Against the U-Boat in the American Theater (PDF). Bolling AFB, DC: Air Force History Support Office. Retrieved 1 December 2015.